Well, I didn’t get around to many restaurants for the Dine O Round, but I knew there was one I couldn’t miss: ZY. 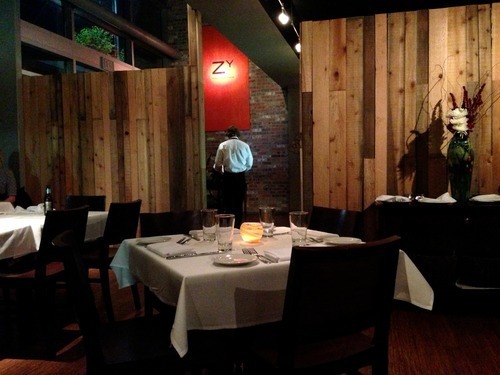 ZY serves upscale, yet approachable modern American cuisine. Luckily they extended their Dine O Round deal an additional week, which gave me time to wrangle a group of buddies together to check it out. They changed the interior around slightly, mainly by adding some walls made out of wood slats. Miles, the general manager, explained that the redesign was partially due to the Zion Curtain laws, and partially because they were ready to change things up. I can’t say I’m a huge fan of the new walls–I’ve always though of ZY as having a modern, hip atmosphere, and adding walls made out of rough-hewn timber didn’t exactly fit, in my opinion. On to the food. Chef Lake treated us to an amuse-bouche that was really fun. He wouldn’t reveal much about the dish, so when we all dug in and half of us said “pear” and the other half said “potato,” we began to seriously doubt each others’ sanity. 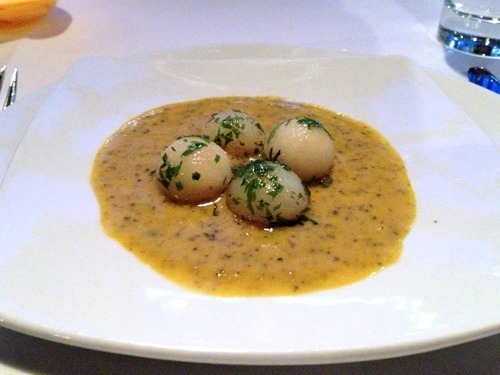 Turn out this dish had two potato balls and two pear balls sitting atop a delicious pumpkin sauce. It was a really nice, well-executed dish. 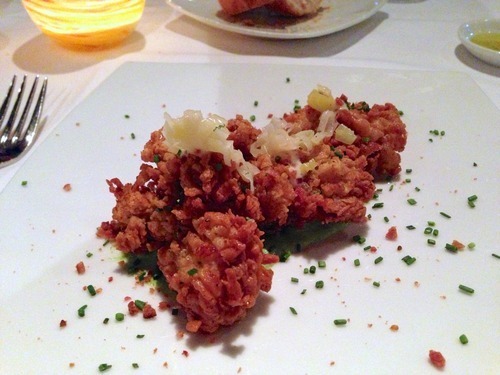 For the appetizer, I went with the buttermilk fried oysters. After trying oysters on the half-shell in the Ferry Building, I swore them off for good (gotta try things at least once, right?). However, the allure of cooked oysters was too much to resist. These oysters were indeed tasty, with just a hint of spice and a nice crunchy texture on the outside. I was really pleased with this dish. On to the main course. 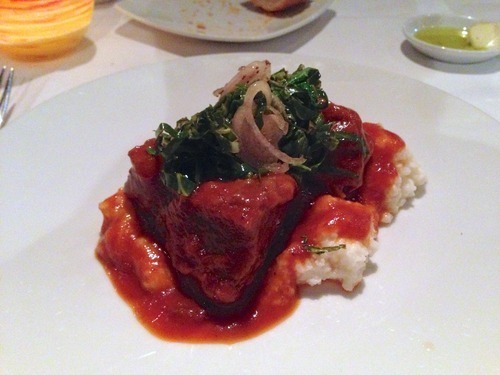 Beef short ribs served with grits and collared greens. One thing that’s always impressed me about ZY is that Chef Lake understands the value of presentation. 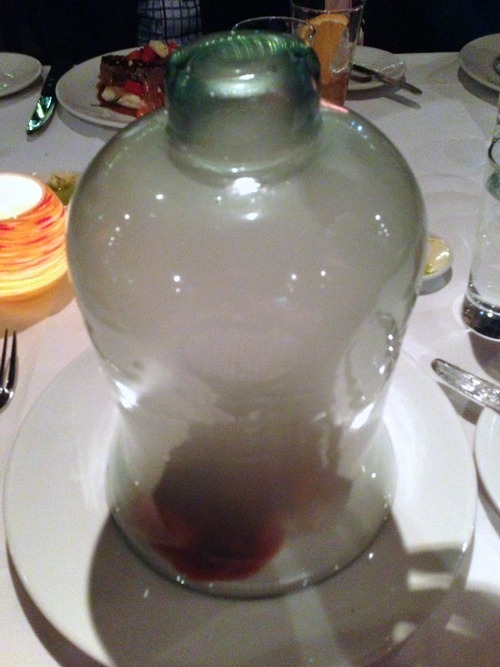 The short ribs were presented in a very fun, if not a bit over-the-top manner, with the servers carrying the dish out, topped with a glass container. As they lift the container off the dish, you immediately smell the beautiful scent of smoked wood, which lightly carries through the dining room. 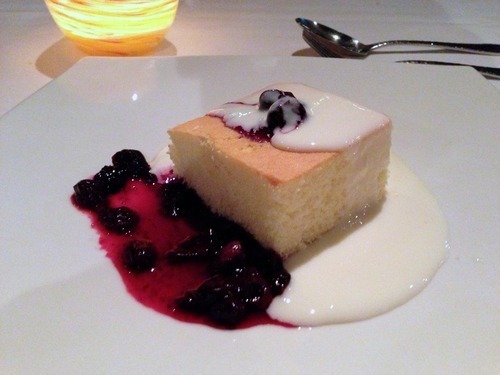 I went with the lemon cake and huckleberries for dessert. The cake had a lovely consistency, almost shortcake-like, and the tart berries were a nice counter to the sweet cake and sauce. Chef Lake surprised us with a fun drink at the end of the meal. It was simply hot apple juice with a bit of honey, grilled grape, and rosemary. Four things I would never think of to make a drink out of. But it really worked well. 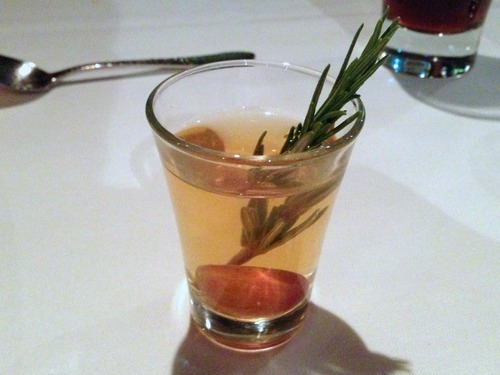 The rosemary would waft into your nostrils as you sipped the drink, creating a sweet, yet savory experience. Service was excellent as usual. Brady, our server, was very knowledgeable about the menu. The pace of the meal was steady, and it seemed he always stepped in at just the right time throughout the evening.